View of the bridge from Cherry Street Pier. SugarHouse Casino's New Year's Eve fireworks over the Delaware River will take place at 6 p.m. and again at midnight. Watching from the waterfront is one of the best ways to see the show. This New Year's Eve, Cherry Street Pier is offering a front row view. 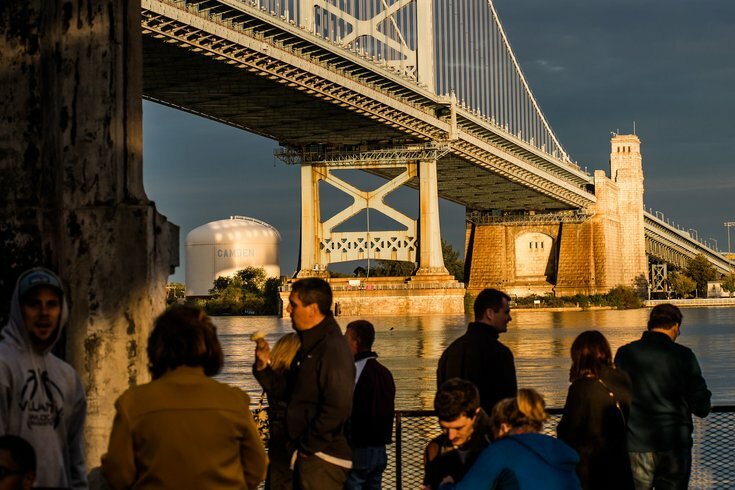 The renovated waterfront warehouse extends out onto the river and offers up-close views of the Benjamin Franklin Bridge. Since Cherry Street Pier just opened in October, this is the first opportunity to celebrate New Year's Eve at the venue. Tickets to the party, which runs 9 p.m. to 1 a.m., are $50 per person. Included are two drink tickets. There will be a full bar to buy additional drinks. The evening will include a performance by DJ Lil' Dave + Lean Wit It, as well as live art and exhibited art. There will be fire pits and heating stations, but attendees are encouraged to dress warm, since they'll be watching the fireworks from the outside garden. Cherry Street Pier's food vendors will also be open during the party.